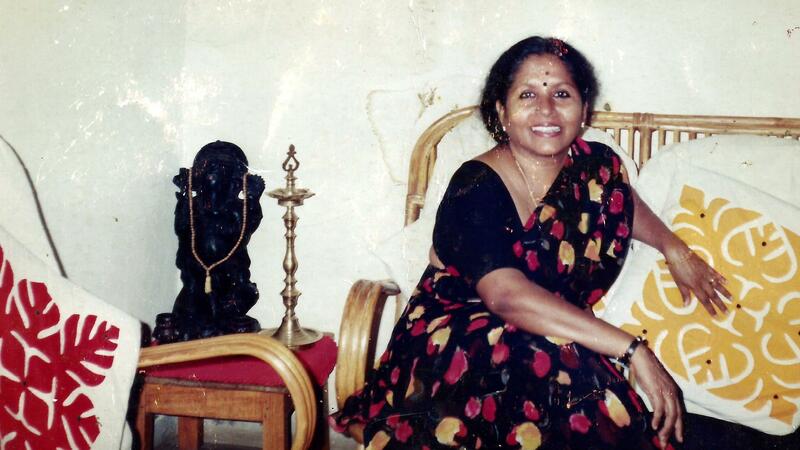 I recall arguing with my mom, Devi, about being selfless, more times than I care to remember. Now, almost every day, I see the truth in something she said when she was with us. I am grateful that I understand the joy of giving without expecting something in return. I have learned that reciprocation need not come from the recipient, because we live in a universe that usually does not betray our trust and faith. Here is an incident that stands out among many I had the privilege of experiencing as my mother’s daughter. The year was 1973. I was in the sixth grade and away at a hostel in Mumbai, and my mother in a working women’s hostel in Chennai. Life was a mess, but it was a defining year for both of us. Mom took the 6:45 a.m. bus, as usual. School started at 7:30 a.m. and her mind was busy going over what she had planned for the day. She noticed a pregnant woman boarding the bus at one of the stops. She couldn’t help noticing that the woman was nervous. Suddenly, the woman began to breathe laboriously, and in a flash of intuition my mother knew that the woman was close to delivering her baby. Realizing that the next stop was at the General Hospital’s entrance, she held the woman’s hand, assuring her everything would be OK. The hospital staff rushed the woman into the labor room, and after what seemed like ages, the nurse emerged to say that the woman had delivered a healthy baby boy. Relieved, she proceeded to school, informing the nurse she would be back later in the afternoon. As soon as school was up, she set off to the hospital. The woman, who had just woken up, was delighted to see her and thanked her profusely. She then shyly admitted that she had to inform her husband. There was no phone number, so she gave her address and my mom promised to let her husband know. Both women suddenly realized they did not know each others’ names and laughed as they introduced each other. The woman’s name was Vanita. Vanita’s house was on the route home, and getting off the bus, Mom asked around until she found the address. She had to wait for Vanita’s husband to return from work. He was overjoyed to hear the news of his son. For the next three days, Mom visited Vanita at the hospital, taking things for the baby: cloth diapers, wraps, tiny clothes she sewed at school. For Vanita, she carried fruits and methi laddus. (Methi is fenugreek and is good for nursing mothers.) She noticed Vanita seemed to alternate between two sarees. On day four, since Vanita and baby were doing well, they were allowed to go home. This was around 3 p.m. and since Vanita’s husband couldn’t afford to miss work, Mom offered to bring her back home. Once home, Mom got busy, settling her in. Anticipating that Vanita would need more diapers and clothes for the little one, she had continued to sew and had a big hamper ready. Vanita and her husband barely made ends meet. He worked as a laborer on construction sites getting work when he could while Vanita worked at a garment factory nearby. Her work lasted three hours in the morning from 9 a.m. to 12 p.m. She had the challenge of figuring out how to look after her baby without losing her job. By now, Vanita and my mother had become fast friends. Mom brought her as many things as she could afford to make her comfortable. Money was meager but her heart was large and she had no problem sharing her own things. Since it was school summer vacation from the following week, Mom offered to come by every morning and look after the baby while Vanita went to work. She arrived at 8 a.m. and bathed the baby as Vanita was still a little nervous. Then Vanita fed the baby and went to work. As her workplace was very close, her employers were kind enough to let her go home after two hours to feed the baby again, and return to finish her work. This went on for two months. When the neighbors asked Vanita who my mom was she jokingly said “Godmother” since the name Devi also referred to the Goddess Shakti. Then it was time for Mom to return to school. Vanita was worried but my mother cheerfully assured her that things would work out. As if on cue, the next day, Vanita’s husband returned home, elated with news about a permanent job in the construction company’s office in a nearby town. It meant a much better salary with accommodation. Vanita was overjoyed and couldn’t wait to tell my mom the news. When Mom visited the next day, she was thrilled. Vanita burst into tears as she would miss my mom. How could she ever repay her for all she had done for her? As they said goodbye, Mom instinctively took off her only piece of jewelry besides her wedding chain, a thin gold bangle, and placed it in the baby’s hand. Vanita and her husband set off to their new life with their baby the next day. The next year, Mom also moved to Hyderabad and life went on. Ten years later, in 1983, we were once again living in Chennai. Mom was working in the old school, taking the same bus to work. I had graduated from college, and was on a three-month part-time job at her school. One morning, we got on the 6:45 a.m. bus as usual. Three stops later, someone tapped Mom’s shoulder. Mom looked up to see a familiar face. She was pretty sure she knew this person. Then recognition dawned on her. She was looking at a slightly rounded Vanita whose eyes were rapidly filling with tears. As Vanita held Mom’s hand, Mom’s eyes searched for a certain 10-year-old boy. Sure enough, a smiling face came into her line of vision. Mom looked at Vanita who looked at the boy and nodded. Overcome by emotion, and so much to say! We arranged to meet after school. I am privileged Devi is my mom; generous in life, and generous in death. We donated her body to the St. John’s Medical College as she wished.